A nurse is being offered a new truck after his was scorched while he helped patients get to safety in the midst of the Camp Fire. "It was just constant explosions," Allyn Pierece told ABC News of his escape from the flames, "Cars are trying to go around the side and bursting into flames, and people are getting out of their cars and running down the middle of the road." Pierce told ABC all of the patients got out of the hospital thanks to the efforts of himself and others. He said he made two trips to get others to safety. After his harrowing ordeal, Pierce shared about the damage to his truck on social media, thanking Toyota and writing, "This truck literally saved my life today." Pierce's hardship didn't end when he escaped with his life. He posted an update on Sunday night to share a GoFundMe page someone set up for him, writing that he'd lost his house and "I don't know where my job sits" since the hospital was affected by the fire. 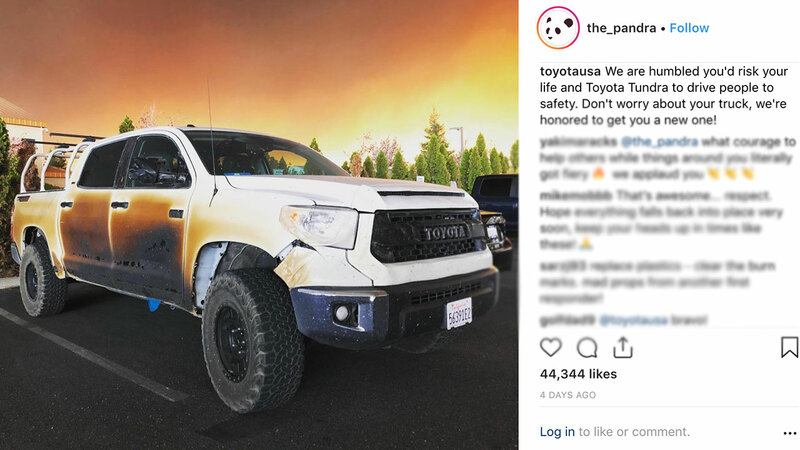 Toyota then chimed in on the original post on both Facebook and Instagram, writing, "Don't worry about your truck, we're honored to get you a new one!"